As awareness of the effects of motor pollution on the environment broadens one winter activity is coming under scrutiny. Snowmobiling is facing access restrictions in North America and emission regulations similar to automobiles worldwide. Noise and nitrogen oxide, hydrocarbon, carbon monoxide and particulate matter pollution from snowmobiles in air and water rivals that of cars but reaches deeper into wilderness habitats. At the end of President Clinton’s administration, snowmobiling in the United State’s Yellowstone National Park was all but banned. Then the controversy exploded, boiling down to environment versus economy. With snowmobile visits in the nation’s largest protected area reaching nearly 75,000 each winter and over 4 million organized riders in North America, snowmobiling is not just going to go away. Environmentalists and the four major snowmobile manufactures, Arctic Cat, Bombardier Recreational Products (BRP), Polaris and Yamaha, may never agree on the details of pollution effects, but their battles are helping to produce low-emission silent sleds. Innovations from the Clean Snowmobile Challenge (CSC), an annual engineering design competition for college students sponsored by the Society of Automotive Engineers (SAE), are spurring commercial manufactures to take on environmental use issues. The Alpina SHERPA won the 2003 CSC, featuring an electronic fuel injected 4-cylinder engine with an exhaust converter with dual oxygen-probes. University of Wisconsin’s 2006 team brought home the Lotus Engineering and Horiba Instruments Award for Lowest Emissions using a Polaris four-stroke sled. This year’s Yamaha snowmobile line-up employs all four-stroke engines for a clean, quieter ride while maintaining power and performance, and BRP proudly touts its award winning clean engine technology in all small motor categories. The move to four-stroke from two-stroke engines improves fuel economy and reduces sled emissions. Many engines now feature fuel injection systems or atomizing carburetors in place of traditional carburetors, reducing hydrocarbons by roughly 70 percent and carbon monoxide by nearly 80 percent. Atomizing carburetors use a platinum, palladium and rhodium metal blend as a catalyst mixing with exhaust gases to turn pollutants into oxygen, nitrogen, water and carbon dioxide. Another innovative technology is the US patented Smart Plug, which uses a catalytic converter as a spark plug. Oxygenated fuels blend ethanol and conventional gasoline to reduce emissions. Combined with low-emission and/or biodegradable lubrication oil, even two-stroke engines can substantially reduce air pollution. Synthetic biodegradable lube oils reduce carbon monoxide and are being studied to determine water quality contaminants. Additional environmentally savvy options include using industrial lubricants from renewable crops like jojoba or other oil seeds benefiting regional farmers and reducing environmental impact. Although electric and hybrid cars are becoming increasingly popular, electric snowmobiles are not engineer’s top priority. The 2004 CSC gold winning entry featured gas electric hybrid technology, but has since been pushed aside for more conventional technologies. The International Snowmobile Manufacturer Association claims sound levels for snowmobiles have been reduced 94% since 1969. And, the increased popularity of four-stroke engines combined with stricter regulations will continue to drive the noise down. Montana’s Department of Environmental Quality estimates the emission lowering changes made to Yellowstone area rental snowmobiles in 1997-98 reduced emission of hydrocarbons by as much as 84 tons (16 percent) and carbon monoxide by about 120 tons (9 percent). Particulate matter was also reduced by as much as 70 percent, approximately one ton per year. And, the reduction continues with advances in clean engine technology. 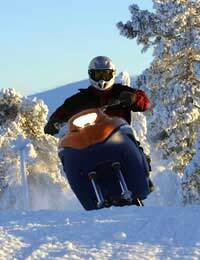 Further use-restrictions and 2012 emission and noise reduction goals in the largest snowmobile markets, European Union, Canada and the United States will force manufacturers to create environmentally friendly sleds worldwide. Two-stroke engine innovations and four-stroke snowmobiles answer some of environmentalists concerns, but further regulations and access restrictions will be needed to make the big four snowmobile manufactures eco-friendly around the world.